Volunteering in Retirement | May Financial Group, Inc.
Those of a certain age will recall these Jefferson Airplane lyrics as a call to action, though for a different period and place. Even with the passage of time and through a lifetime of changes, the desire of baby boomers to make an impact on the world has not diminished. Retirement is no longer about the hammock or unending hours of golf. It is a period of rejuvenation, second chances, and renewed growth. For many, this new phase includes contributing their time and talents to an organization in need. An important first step is to engage in honest self-assessment. Inventory your skill set and interests. This will help identify what sort of volunteering opportunities are the best match for you. Determine the commitment you are willing to make. Is this something that you want to devote 5-10 hours a week to, or are you willing to commit to more time? Is this something you want to do locally, around the nation, or even the globe? Will this volunteering be done individually, as a couple, or as a group? There are plenty of resources to get a good view of the opportunities that exist. One place to start is by asking friends, family, and colleagues. Another option is to use one or more of the many tools created to help identify volunteering ideas that may deserve your consideration. For instance, Serve.gov is one such tool run by the federal government. Another website you may want to review is Volunteermatch.org. Another approach may be to pick charities that you support and check out their volunteer opportunities. Don’t be afraid to call them since some opportunities may not be advertised. If you do choose to volunteer during retirement, you may find that you will receive as much as you give. Adviser not licensed in all States. Advisory Services are Provided through Creative Financial Designs, Inc., a Registered Investment Adviser, and Securities are Offered through cfd Investments, Inc., a Registered Broker/Dealer, Member FINRA & SIPC, 2704 South Goyer, Kokomo, IN 46902 765.453.9600. 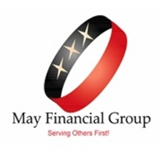 May Financial Group, Inc. is not owned or controlled by the CFD Companies.